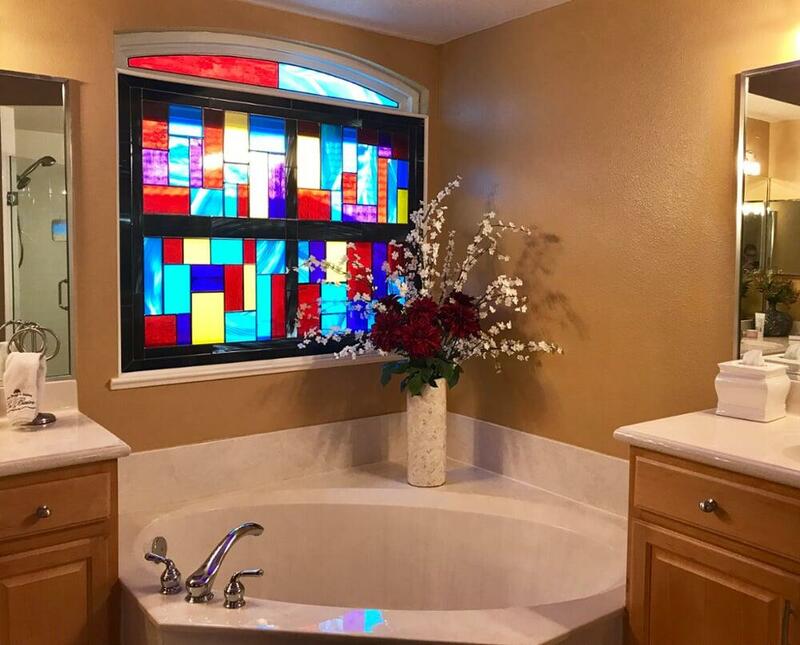 Modern design stained glass bathroom window with deep reds, violets, blues and turquoise. Highlighted with yellow. A strong & modern, but classy piece of bathroom glass providing privacy and artistic flare. The client was looking for something to provide bathroom privacy, while obscuring the view of a neighboring property and still allowing light into the room. They had spent some time looking at the kind of styles they like and wanted a more contemporary look. This piece of glass was installed over the original window which removed the need to involve contractors. The black regions forming the cross through the center of the design disguise the window frame behind. Once installed, the window was trimmed out with the same trim as the rest of the room, resulting in a seamless, functional and beautiful installation.